MOSCOW, June 9. /TASS/. 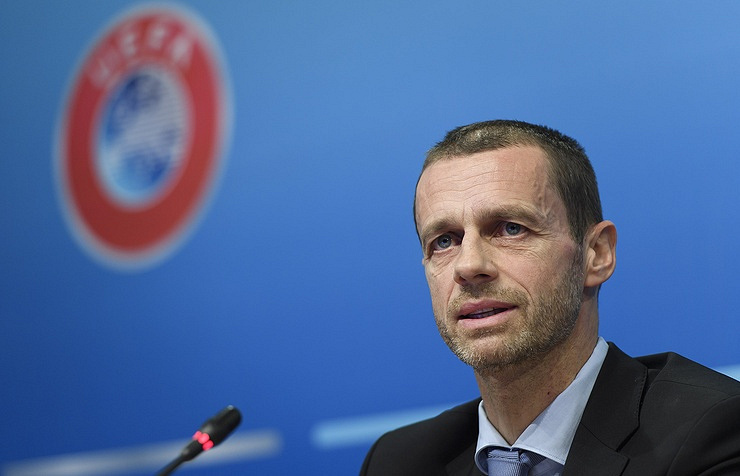 President of the Union of European Football Associations (UEFA) Aleksander Ceferin has arrived in Russia's capital to take part in the 68th FIFA Congress on June 13 and then to attend the opening match of the 2018 FIFA World Cup in Moscow on June 14. In an interview with TASS, Ceferin airs his views on Russia’s high level of preparedness for hosting the World Cup, about its potentially positive impact on Russian football after the world championship, and what UEFA may gain from Russia’s experience in organizing the 2020 UEFA Euro Cup. - How do you rate Russia’s readiness for the upcoming FIFA World Cup? - Russia is ready to host the FIFA World Cup and I am sure the country will put on a show for all fans that will travel there during the tournament. I am confident that we will see a very successful event that will be remembered for many years to come. - What is your schedule in terms of visiting the Host Cities and watching the games? - I will be traveling to Moscow for the FIFA Council Meeting and Congress and will then stay to watch the opening game on the 14th of June. After that, I will decide what other matches to attend. As you can imagine, we at UEFA have many European Football matters to attend to during the summer so I am not free to travel around Russia for a whole month. I hope I can watch more games in Russia before the final… we shall see. - How will the hosting of the 2018 FIFA World Cup change Russia’s football profile in the European football community? - The World Cup offers the host nation a global platform on which to promote itself during one whole month. This presents Russia with a once in a lifetime opportunity to showcase its passion for football but also its culture and its values. I am sure that during this month, the Russian people will embrace the opportunity to show all the human and professional qualities they have to the whole world. 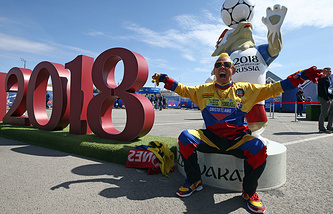 - In which ways and areas do you think hosting the FIFA World Cup will help boosting progress of Russian football? - Hosting a World Cup, just like hosting a Euro Cup, injects the organizing country with so much energy and so much passion for football. Russian people of all ages will get an opportunity to watch the best players on the planet in action at their home stadiums and you cannot overestimate the impact that it can have on all generations of football lovers. The young people going to stadiums to watch Cristiano Ronaldo, Leo Messi, Neymar, Harry Kane, David De Gea, Thomas Muller and others will be inspired and will want to be like them one day. The fact that so many fantastic stadiums and training centers have been built will also give Russian football a great opportunity to develop more players utilizing top level facilities. It is a great opportunity for Russia to boost its football, no doubt about it! - Vitaly Mutko has been at the helm of Russian football for 12 years. What can you say about the impact he has had on the development of Russian football? Mutko is still in love with football and has always put a lot of energy and time into helping develop the game in Russia. - Vitaly Mutko was the President of the RFU, a member of the Executive Committee and later also a member of the Council of FIFA. He invested a lot of energy and effort in order to coordinate and complete many complicated infrastructural projects that were needed for the FIFA World Cup – stadiums, roads, airports. He has a great desire to prove that Russia can be an outstanding host of such a prestigious football event. He also had excellent leadership of the LOC supported by Aleksey Sorokin, who is a great professional. - The Russian Football Union has a new president starting from 2018. How are your relations with Alexander Alayev and the new RFU administration? - I know Sasha very well since he has been General Secretary of the Russian Football Union for a few years. He has also been leading the UEFA Futsal and Beach Soccer Committee and previously was part of the UEFA Marketing Committee. I can say he is a true professional. I must also underline the fact that the relationship between UEFA and our Russian stakeholders has been on the highest level, not only with the President and the RFU administration, but also with the Russian Football Premier League, led by Sergey Pryadkin. - Where should Russian football put the focus on in the upcoming years in terms of its development? - The focus has to be on developing football at grassroots level and making sure that young talent is nurtured in the right way. Russia has a great history of producing talent. I am sure that with the boost from the World Cup, and the work done by the federation, it will rise to the top of European Football once again. The women’s national teams have also improved a lot, with the senior squad qualifying for the UEFA Women’s Euro 2017, and this is an area where I am sure the development will continue. -The 2018 FIFA World Cup leaves a long-lasting legacy for Russian football, notably also with new state-of-the-art stadiums. Do you think that Russia can leverage this legacy and aim at hosting a Champions League or a Europa League final, perhaps already in 2021? - Thanks to very good football infrastructure that has been built all over the country, I am confident that Russia will have a chance to be the host of various football events, both for men and women. It is important to emphasize that after my arrival to UEFA the organization had put in place a transparent biding procedure also for the finals of the European club competitions. It needs to be seen what the RFU plans are and if they intend to make a bid for the club competition finals in the future. If they decide to make such a bid, then they will need to fulfill all the necessary criteria, which will be evaluated by competent UEFA administrational structures and finally by the Executive Committee. The bid regulations that we have implemented make the process very clear and transparent, allowing the best bid to win. - European football is preparing to host its jubilee 2020 UEFA Euro Cup across 12 countries. 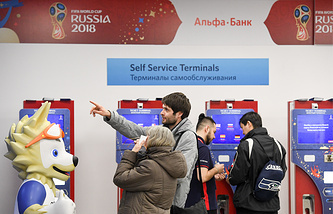 Do you think it might be worth considering something similar to Russia’s World Cup Fan-ID tool to ensure the security of fans and provide them with support and comfort when travelling all around Europe? - I am aware that the Fan-ID is a document that all spectators of the 2018 World Cup must have to get access to stadiums. It also guarantees visa-free entry to the Russian Federation and allows the free use of transport. The Euro 2020 is a challenging project and we are looking at a variety of options to facilitate fan travel and access to the stadiums. I have full confidence in the UEFA team that is in charge of this matter and they will find the right solutions. - Also how would you evaluate this tool for the 2018 FIFA World Cup? What else do you think that European football can pick up from Russia’s World Cup hosting concept and experience? - It is a new tool so we will see how it works during the World Cup. We will have UEFA experts present at the tournament in Russia in order to observe all operations and we will see whether there is anything that we would like to take to our events. - Do you think St. Petersburg will be 100% ready for the 2020 UEFA Euro Cup after hosting the World Cup matches? Or will UEFA have separate special requirements that may be differing from those at the 2018 FIFA World Cup? - The St. Petersburg Stadium already hosted matches in the FIFA Confederations Cup. It is ready for the World Cup, so there is no reason to believe that it would not be ready for the Euro 2020. Everything is in order and it will surely host successful matches in the European Championship in two years’ time as well. - How often does UEFA plan on visiting St. Petersburg for inspections ahead of the 2020 Euro Cup? - There are regular inspections which take place in St. Petersburg just like in all other Euro 2020 stadiums. - As a premiere, it will be the FIFA Congress in Moscow, which will decide on the host country or host countries of the 2026 FIFA World Cup. Does European football have a consolidated position ahead of the vote? - It is not up to me to tell any member association how to vote. Each of the 55 UEFA members will carefully study the two bid dossiers and then make the decision they believe is best for the 2026 World Cup. I don’t vote and I don’t influence anyone to vote one way or another. - Returning to the pitch: who are your favorites? Will a European team or a team from another continent win the 2018 FIFA World Cup? - If you take a look at the last three World Cups, you will see that five out of the six teams that made the final are from Europe so it is fair to say that UEFA nations are definitely among the favorites. I hope that we see another all-European final with the best team winning!